The bell rings and pandemonium ensues — the screaming traders, the mad waving of colorful stock order slips, the smell of money. Wall Street? No, last week Brew Exchange rang the opening bell on a fresh concept of stock market pricing at a new West Sixth Street location. Here, beer is sold according to the laws of supply and demand. Real-time market conditions dictate pricing allowing you to get some unknown beers at a discount, while driving the price of more popular brews higher. Owner Nick Adams, is an idea collector. He constantly takes notes on things that catch his attention and when he stumbled across the idea for a bar with a trading theme, he and his four partners (including the three co-owners of Kung Fu Saloon — Michael Dickson, Chris Horne, Ben Cantu — as well as Tim Womac) moved quickly. He paired a unique software program that interfaces with cash registers to create stock market price fluctuations on a huge selection of beer, capitalizing on the surging craft brew movement in Texas. 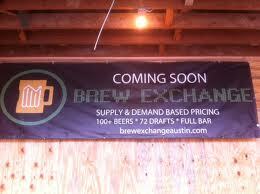 “No one in the nation does it like Brew Exchange,” says Adams.